DV Systems of Barrie, Ontario, Canada, produces 500 different models of air compressors. With plans to build upon a growing customer base in the United States, it sought to improve its competitiveness. The company hoped that replacing its outdated equipment would give it the capability to produce parts faster and more accurately while helping it to maintain operations in North America. It also wanted to gain the ability to quickly and easily switch production from one product to another. To accomplish this goal, the company required high-performance machining technology and strong vendor support. For a year, DV Systems worked closely with SST-Canada, Sandvik for tooling, and fixture manufacturer ABA Machining & Welding to execute its vision. Together they created a plan that changed the way DV Systems would produce parts. Instead of fabricating identical parts on the same fixture, as it had in the past, the company would machine all components at once on a single fixture for a complete air compressor. These vendors collaborated to make that vision a reality. As part of this solution, DV Systems purchased a Makino a61nx horizontal machining center. It also began digitizing its machine programming process, bringing it up to modern standards. 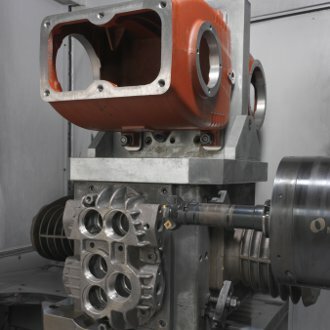 After purchasing the a61nx high-performance machining center, DV Systems was able to execute its vision of producing a full set of parts, or a new compressor, with each completed fixture. This new method helps the company reduce its work-in-process inventory and enables it to get products to customers in just a week. The a61nx easily machines gray iron, meeting tolerances of plus or minus 0.0002 inch, with cylinder roundness of plus or minus 0.0005 inch and squareness of plus or minus 0.0004 inch. The rigidity of this high-performance machining center produces virtually no scrap. Its new processing capabilities have enabled DV Systems to produce twice the amount of parts per day on one particular product, going from four to eight. The company has also replaced three of its previous machines with the a61nx and can operate using three-fourths of its previous shift. These measures give operators the chance to be more flexible and take on new roles. With strong growth in Canada, DV Systems has been able to work on building U.S. sales, where there are new opportunities.